I just love finding magical little houses! This tiny charmer is hidden behind a tall hedge, enclosed by a double gate and painted a beautiful gray that has weathered to perfection. The drive is edged in cobblestone and paved with gravel. The tiny treasure is covered with cedar shakes and the roof is standing seamed tin—perfection! 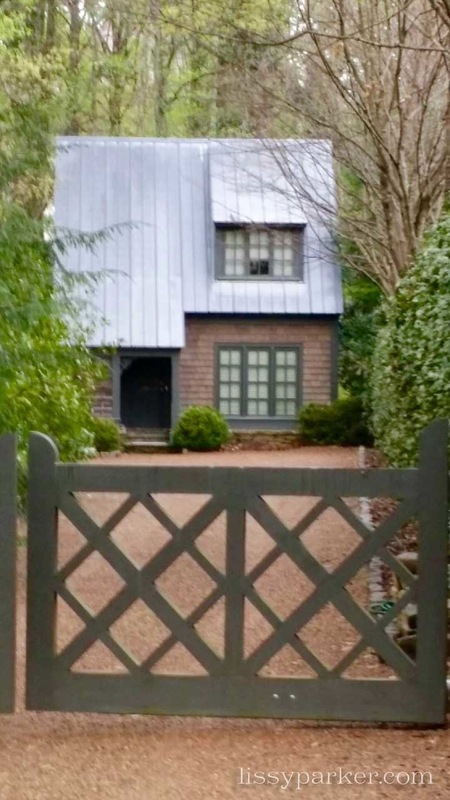 I think the upper dormer is probably a bedroom with a view of the courtyard and hedge. I friend told me this use to be part of a larger property, but is now all on its own. I can see this as a welcoming guest house or a weekend rental … uh-oh, I see a project on the way! What an amazing home – so charming and looks like the perfect getaway!! I think so too! It would be a wonderful little addition.